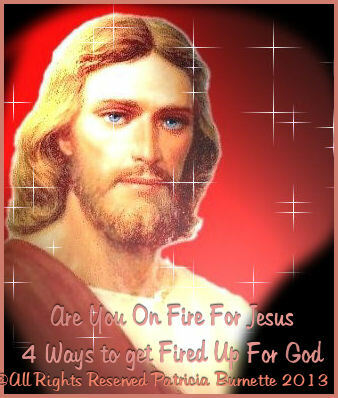 Welcome to "4 Ways to get Fired Up For God"
Exodus 35 , tells about the people which God brought out of Egypt the ones who built the tabernacle for the Lord was very stirred up about all the things of God, they gave to Him very freely with full willing hearts. There are times when we wonder how we can get stirred up for God. I know for many years I have been excited about doing things for God, and I always wanted to do what was right, and always found myself making other's happy, because I felt like that was what I was to do for Him. To make other's happy and do for them to me it was doing for God as well, no matter how much I had to go through to make them happy. But, what I was doing was making sure everyone else was happy and content, but I was happy to help them, but my inner being wasn't as happy as it should be, because I wasn't taking time to do what I needed to do for myself, or being stirred up like we are to be. I thought, that by doing for other's and making sure their needs were met, that I was doing what God wanted me to do, to be doing His will. Even though I was doing so much for other's, I wasn't being able to be stirred up for the Lord as I should've been and making sure that I was taking care of me, spiritually within myself ad I was to be in the Lord, so many things I was trying to do, was being like I felt the Lord wanted me to be. But, what He wants me to be is fired up for Him, and still be all I can be, and still doing for other's. I have made a list of 4 Things to Do To Be Fired Up and Stirred up for God! 1. Make sure to be around people or atmosphere with people who are excited about God and the things of God. Before long you will soon be to. If, we associate ourselves with people who are negative minded, who curse us, call us names, lie to us or on us, bring our pasts up, and brings tensions etc. We need to stay away from people like that. We seem to loose our focus our excitement, our visions, which we keep our hearts on. Being around people who are lifeless, hatefulness, who want to do nothing but cause trouble, gripe, fuss, complain, watch filth, talk dirty, boasting,etc. If, we do not stay away from those type of people we will not be able to stay focused, but yet we will end up just like them, and we cannot stay stirred up in the Lord this way. 2. Make up your mind you are going to take action about the negative thoughts and ways out of your mind and body, instead of wishing and hoping things will get better and things would get better. The only way they will get better is getting away from the above actions of others, stay away from those who cause you pain and anguish. Realize, you are better that than and you want to have full victory over your feelings and how you want to live, be strong enough to stick to it, stay with the program. Stick to your guns, and so what it takes to get to your goal. If, you do not want it to be a victory, noone can be the blame but yourself, and cannot get yourself motivated to go forward. And, you will have to live like you have been. It starts with you! We all need to stop feeling sorry for ourselves, and get out of our self pity ruts, and make the changes that will benefit us. STOP, the "I wish" and the "I want" and "I can't" ---- when you really can. Go for better not the bad circumstances you are always in, because change begins with you, and you alone, and ask God to help you get stirred up, fired up inside for the change and being for Him to. 4. Stay focused and on fire for God, Romans 12:11, which encourages us, "Never lag in zeal and in earnest endeavors, be aglow and burning with the Spirit, serving the Lord." In order to always be aglow we have to stay on fire, Speak the Word of God to fan the fire in form of Prayer, praise, praising and confession. This will help us keep stirred up fired up and on fire for God, and keeps us stirred inside Keep that fire burning, prevent your spirit from stirring and the free to go out. Everything we do is to be done unto God, and for His glory, we should do it through Him, to Him, for Him, and By Him, with Him. And we should do it all willingly with our hearts, minds, and souls, and keep it stirred Up!